This cultivator is for deep-aerating hard, pressed, compact and 'capped' soil. After aerating, the soil is able to capture rain or irrigation water and air can penetrate the soil again. Result: plants will grow better and more easily. The tine of the cultivator is shaped like a small plough and made from steel. 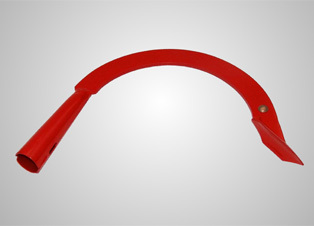 The thin curved shaft gives only little resistance while working. A copper rivet is mounted to enrich the soil with the trace element copper.